O’Sullivans Bar in Douglas, Cork has set up three iPads which customers can use to browse the web and catch up on the news. IF YOU’VE EVER seen someone using a tablet in a bar, it’s normally the staff behind the counter, but one Cork bar is now providing iPads in its premise for customers to use. 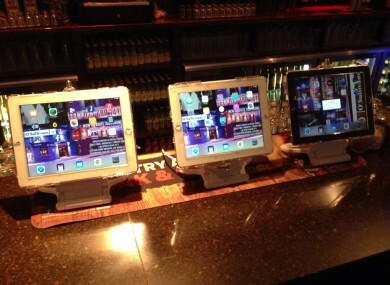 O’Sullivans Bar in Douglas, Cork has set up three iPad 4s in its bar so customers can browse the web, check their email and read the news while they’re there. The devices were set up this morning and the owner, Donal O’Sullivan, explained that they set them up because more people are now looking for their news online. Newspapers are yesterday’s news… while we have newspapers available here, we’re looking for innovative ways to bring people in during the week. The three iPads will be available to customers during off-peak times on Monday to Friday, and will be removed during peak times such as Saturday nights. O’Sullivan says that the devices are protected from spills and any other mishaps that may occur. While the primary purpose is to read news, O’Sullivan said that people can use them to Skype relatives or watch videos on the device. He also considering the idea of adding a Netflix account to the devices so people can watch shows while they’re there. The bar has also experimented with other ideas such as a smartphone quiz, requiring participants to use their phones to answer questions under a strict time limit. Although they were only set up this morning, O’Sullivan said the reception towards the idea has been “positive” and would consider making more iPads available to customers if it goes well. Email “Fancy an iPad with that pint? This Cork pub is now providing them for its customers to use”. Feedback on “Fancy an iPad with that pint? This Cork pub is now providing them for its customers to use”.